Well, I don’t know what the weather is like where you are, but here we have the sort of driving wind and rain that only a British bank holiday can provide. As an antidote I thought it would be useful to have a round up of this summer’s silent film festivals. So here’s a line-up of some of what’s on offer from June through to October (a bit late for summer, I know, but Pordenone in October is just pefect, once you’ve endured the welcoming and obligatory one day of heavy rain). 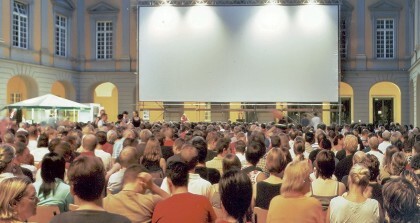 The Cinema Ritrovato film festival, Bologna takes place 28 June-5 July. This year there are a number of silent strands: a series dedicated to films made exactly 100 years ago, silent star Emilio Ghione, Lev Kuleshov, Comic Actresses and Suffragettes, and Monta Bell. A highlight is Neil Brand’s orchestral score for Hitchcock’s Blackmail. Other strands include Josef von Sternberg and Marlene Dietrich, Warner films of the 1930s, films based on the work of Giovanni Guareschi (creator of Don Camillo), Cold War films on the atomic bomb, and a Cinemascope selection. The San Francisco Silent Film Festival takes place 11-13 July 2008. Films announced so far are (Friday 11 July) The Kid Brother (1927), (Saturday 12 July) The Soul of Youth (1920), Les Deux Timides (The Two Timid Souls) (1928), Mikael (Michael) (1924), The Man Who Laughs (1928), The Unknown (1927), (Sunday 13 July) Die Abenteur Des Prinzen Achmed (The Adventures of Prince Achmed) (1926), The Silent Enemy (1930), Her Wild Oat (1927), Jujiro (Crossways) (1928), The Patsy (1928). The annual festival of silent and early sound comedy, Slapsticon, takes place in Arlington, Virginia 17-20 July. Programme highlights include Hal Roach rarities, Raymond Griffith, Mack Sennett, and Early Comedies. Capitolfest, central New York’s silent and classic film festival returns 8–10 August at the Capitol Theatre, Rome, NY. Titles announced include The Little Wild Girl (1928), The Spieler (1928), Romance of the Underworld (1928) and The Shakedown (1929). Strade del Cinema is an international silent film festival with live music, held in Aosta, Italy. This year’s festival takes place 10-17 August. No titles as yet, but they have announced a Young European Musicians Contest and a SilentARTmovies contest giving “young Italian artists or foreigners living in Italy the opportunity to express an original point of view on Silent Cinema”. The annual festival of silent films held in Bonn, Germany, Bonner Sommerkino, will take place 14-24 August. The only title announced so far is Harold Lloyd’s Girl Shy. Cinecon is a classic film festival of silent and early sound titles, held in Hollywood, held over Labor Day weekend. This year’s event takes place 28 August-1 September. Titles don’t get announced until a month before the event, but you are promised “nearly thirty rare silent and early sound feature films and as many short subjects from the nation’s leading film archives and Hollywood studio vaults”, with an emphasis on rarities that seldom get public screenings. This year’s Cinesation takes place at the Lincoln Theatre in Massillon, Ohio, 25-28 September 2008. Titles announced so far include Sold for Marriage (1916), The Grey Vulture (1926), Soul of the Beast (1923), The Cop (1928) and False Faces (1919). The 16th Annual Buster Kearton Celebration takes place in Iola, Kansas, over 26-27 September 2008. This year they are looking at the joint legacies of Keaton and Will Rogers. The 2008 Pordenone Silent Film Festival will be held 4-11 October at Pordenone, Italy. Among the main festival themes will be W.C. Fields, Aleksandr Shiryaev, French comedy of the post-war silent era, Hollywood on the Hudson(coinciding with Richard Koszarski’s new book on the history filmmaking in New York), Viktor Tourjansky, The Griffith Project 12 (1925-1931), and Early Cinema, including the Corrick Collection 2 (Australian collection of early actualities), the 30th anniversary of the FIAF Brighton congress, and W.K-L. Dickson (subject of a new biography by Paul Spehr). Keep up with what’s going on through this sites Festivals page, or the highly recommended Stummfilmfestivals (in English as well as German). And try to keep warm.